Experience – You get a leak-free, durable diapering system with years of proven performance. 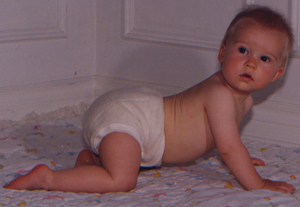 Mother-ease has been designing and manufacturing top quality, leak-free cloth diaper systems for almost 2 decades. Quality – Mother-ease manufactures all of their products in their own facility. Full control over production allows them to monitor each step of the production process and ensure their Quality Control Standards are met. Their custom made diaper cloth, the testing of all of their fabrics and their Quality Control Standards ensure Mother-ease cloth diapers are of consistent top quality. Functionality – With the Mother-ease One Size Cloth Diaper System the cloth diaper is separate from the cover – this creates 2 independent pieces working together to prevent leaks. The separate system maximizes washabity. Wash water is better able to flow through the diaper when the waterproof cover is not attached. Comfort – Mother-ease Cloth Diapers are comfortable by design. Stretchy terry cloth diapers with fully elasticized waist and leg openings ensure comfort as baby moves, while breathability incorporated into the cover, encourages air circulation that reduces heat build-up. The covers are roomy and fit perfectly over the cloth diapers. Environmental Responsibility – Mother-ease has been powering its facility with 100% green energy since 2007. Their Bamboo Terry and Organic Cotton diaper fabrics as well as the dyes used for their colored diapers have all been rated as Eco-Friendly. Cost Savings – With One Size Diapers you don’t need to buy new diapers as your child grows. Mother-ease One Size Cloth Diapers fit from 8.5 – 35 lbs. ALSO – the separate cloth diaper system enables you to purchase fewer covers than diapers. When you buy a full-time stash of cloth diapers you will need only 4 covers (of a particular size) since they can be re-used before washing. Diaper systems such as Pockets or All in Ones have a cover attached to each diaper which significantly increases their cost.